Ever woken up with an abscess or had a sleepless night due to a painful toothache that even painkillers can't shift? Oral hygiene and dental care are extremely important factors in our general health that are often pushed aside in order to deal with more immediate problems. Fortunately, there are a few natural products that can be included into your daily routine that will greatly reduce your chances of infection as well as reducing gum disease and improving general oral health. 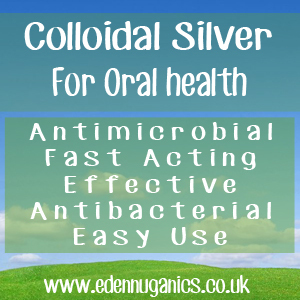 How Can Colloidal Silver Help With Dental Issues? Commercial mouthwashes sold as a means of reducing oral bacteria often contain alcohol and relatively harsh chemicals, some of which have even been linked to oral cancer with overuse or misuse. In addition, Fluoride is often added to these products which many people nowadays seek to avoid wherever possible due to its overuse in the public water-supply and toothpastes etc. Fluoridation of public drinking water began in the 50's and 60's and has undoubtedly been beneficial to the dental care of many nations but at what cost? Fluoride is known to be very toxic at certain levels and there is speculation that, in some countries, the quantity added to public water supplies is not adequately regulated leading to potential health problems in the general public. Colloidal silver, therefore, is a good alternative product for your oral hygiene containing only silver particles and distilled water. Colloidal Silver is one of the most popular and effective natural remedies for keeping your teeth and gums healthy and infection-free. It works as a natural anti-bacterial mouthwash helping to prevent the build-up of plaque, something known to lead to the formation of cavities and gum disease. Colloidal silver can also be used to prevent painful tooth infections worsening if you hit them early enough. Indeed, many people have been able to avoid fillings and even root canal work altogether thanks to the anti-bacterial properties of colloidal silver. Simply swill colloidal silver in your mouth for around 3 - 5 minutes once a day for general health. This can be increased to 4 times a day when suffering from infection or gum disease. The first step is make a mixture of colloidal silver and baking soda. Begin with the baking soda and then drop the colloidal silver in slowly, whilst mixing, until you reach a paste like consistency. Next, apply this to your toothbrush. It is best to use a non electric type for this as the mixture can be slightly abrasive when brushed at high speeds. Brush for around 4 minutes and rinse with colloidal mouthwash as mentioned above. A good idea is to make this in batches and store in an airtight pot in the refrigerator where it will keep fresh for up to 2 weeks. Other Natural Remedies For Oral Hygiene? The traditional Indian medicine of Ayurveda has made use of sesame oil for thousands of years. The process involves adding around a spoonful of sesame oil to the mouth and swilling for 15 - 20 minutes. This has become more popular in recent years and is now often referred to as 'Oil pulling'. Oil pulling will help to remove unwanted bacteria from the mouth, but is also said to help whiten and strengthen teeth and gums. In addition to sesame, coconut oil is also very popular for this use. You probably know some of the amazing benefits of bananas, but did you know that the banana skin could help to clean your mouth as well as whiten your smile? This remedy involves rubbing the inside of a banana skin against your teeth for around two minutes before rinsing with water. Banana peel is a good source of minerals like potassium, magnesium, calcium, etc. It also works as an antioxidant and offers vital carbohydrates and fibre when eaten. Tulsi, also known as basil leaves, is a fairly common plant in Indian households and is considered holy by many religions probably due to its health benefits. It is very good for maintaining dental health, counteracting bad breath and for massaging the gums. It is also useful in pyorrhea and other teeth disorders.